As the spring has progressed my birding goals this year have been changing focus. Some of this is no doubt from mentoring a new birder, but I think it really began back at the end of January when I was visiting Laura Erickson in Minnesota. While I try not to make any specific number a goal, most birders cannot deny the draw of seeing new birds or the same birds in new situations or locations. We mark this in different ways. Some birders keep state, county and even city lists, for example. Laura’s adoption of Pip (the cutest birding dog around) provides Laura a fresh start with listing birds from an adorable puppy’s perspective. Some birders tweak their personal rules to make sure they count both sexes or tick off juveniles or fledglings. In any case, we are driven by the allure of new experiences and change. I’ve mentioned before how this sometimes conflicts with my urge to compare locations across time. If you’re often birding the same locale, you have less time to find new places, so there’s always a need for balance. I’ve decided to shift the focus a little from location-based birding to species-based birding. Since I “ticked off” some boreal species this winter, I’m focusing more on finding species in the area I have not yet seen, and then finding places (or “hotspots” to use the eBird lingo) where they are likely to be found. One group of birds I have have very little experience with are rails. Sure, I’ve seen several Soras, and I can count the Black Rail I heard two Januaries ago at the Space Coast Birding and Wildlife Festival. Coots and Gallinules are of the same family as rails, too. But I’d really like to see “prototypical” rails, such as King, Clapper or Virginia Rails. I put the call out on the Brdbrains e-mail list that I was wanting to see rails, and that I would welcome any suggestions for location. I got a reply from someone saying that a friend of theirs was “regularly” seeing a King Rail and some chicks at the Viera Wetlands (that’s the Ritch Grissom Memorial Wetlands at Viera for the pedants). In order to catch most rails, it’s best to go early or stay late, conventional wisdom says. How early? Viera Wetlands just after sunrise, when the lighting is dramatic, but maybe not the best anything other than silhouettes. There was a good scattering of Black-bellied Whistling Ducks around most of the property, and my new camera doesn’t do too shabby in low light – at least once the sun angle is right. 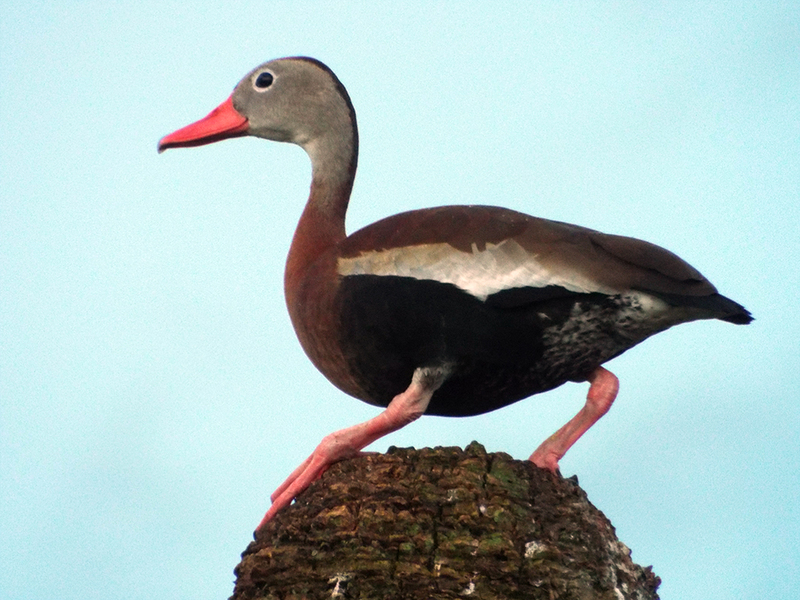 Black-bellied Whistling Duck hanging on tightly to his tree. I waited near the area described in the Brdbrains e-mail, but it seemed to me it was the quietest area in the whole Wetlands. I indulged one impulse to play a King Rail call and listen for a response, but I heard nothing. 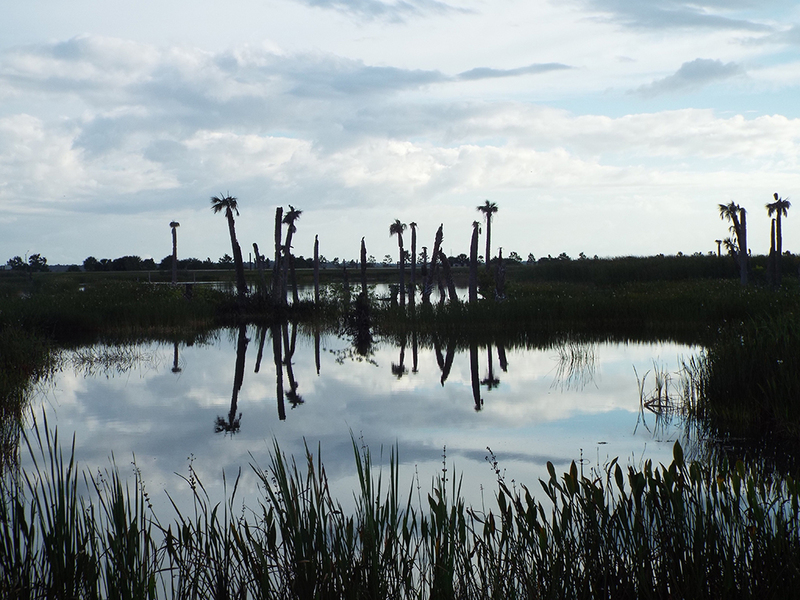 I decided to walk roads around the inner part of the Wetlands as the sun crept higher. 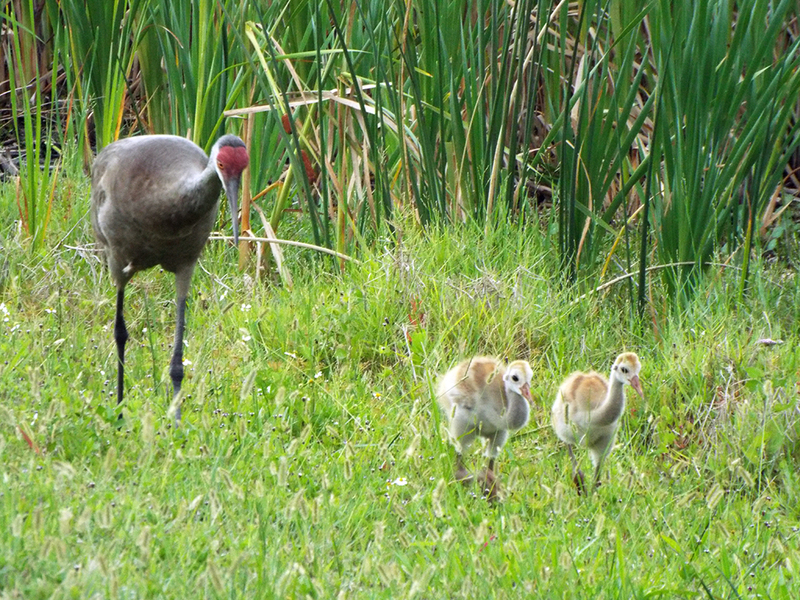 At least one pair of cranes is raising chicks at the Wetlands this year. I’ve noticed far fewer crane chicks this year then the past two. I wonder if it has to do with how wet our winter and early spring were, here on the Space Coast. Many of the nesting sites I am familiar with were inundated well into spring, so I am guessing many nest sites were just inaccessible. It’s possible some crane couples are starting their broods late this year, now that the water levels have gone down. Mother crane and her two kids (Dad was off to the right). The rookery island was busy with the usual Cattle Egrets and Ibises, with Anhingas thrown into the mix. The birds were getting their mornings going and having breakfast. There were Common Gallinules along many marsh edges, and some Least Bitterns were awkwardly flying in and out of the reeds. 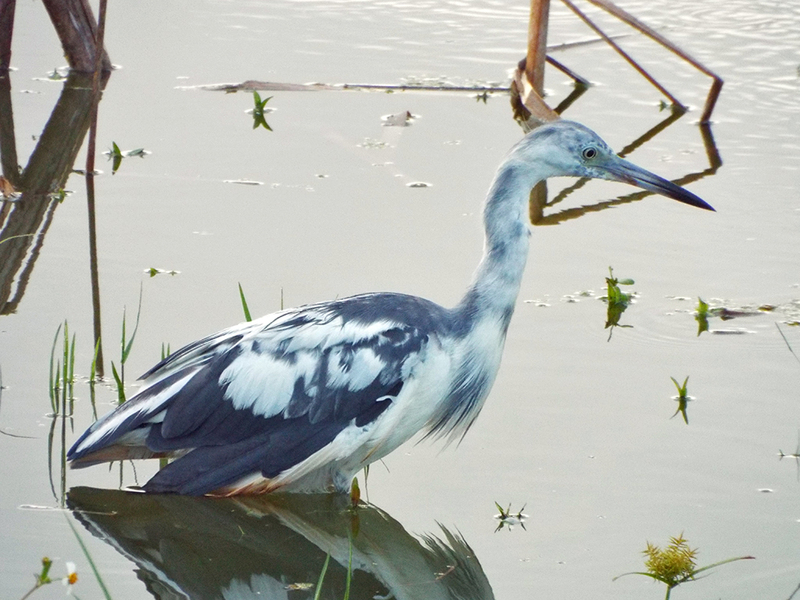 Many other herons and egrets were stalking prey or bickering among themselves, too. Male Red-winged Blackbirds were already displaying and chasing females around, and the Boat-tailed Grackles were piping and clicking away. One Crested Caracara soared quickly overhead, too. Little Blue Heron in transitional plumage. It was clear I would not be seeing any rails, after spending a total of an hour or two at the Wetlands, I drove down to the Moccasin Island Tract to see what might be happening there. 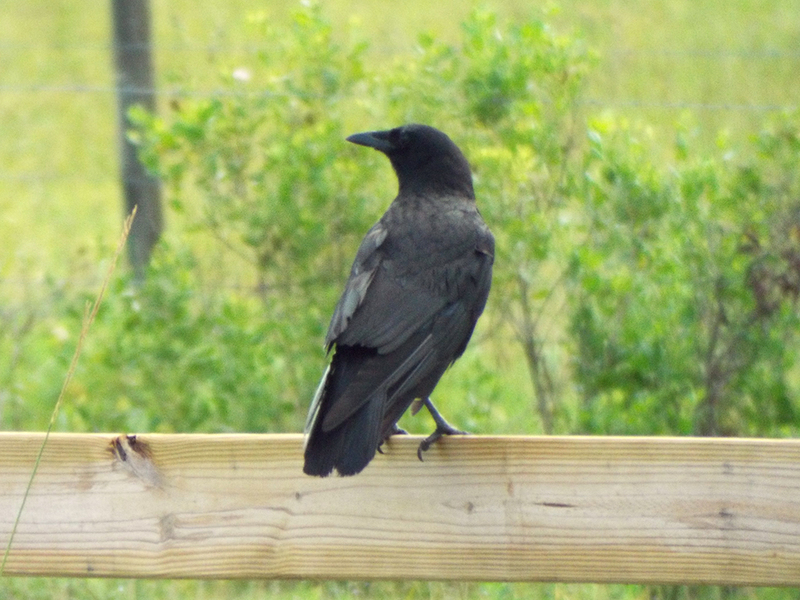 As I pulled into the parking area, a pair of American Crows was on the wooden fence, calling out loudly. They seemed a little perturbed at my arrival, so I parked on the south side of the lot. I wanted to walk the north corridor for about a half hour or so before heading back, which meant walking by the crows. They turned and used about a half dozen or so vocalizations in my general direction as I got closer. They flew off to the opposite corner of the lot, calling loudly. I called out “sorry guys!” as they flew off and went out of the parking area and started up the trail. After I got several hundred feet up the trail, I could hear the crows calling behind me and some faint muffled thumps that sounded suspiciously like Saturn plastic door panels being whacked. I turned to see two crows attacking my car. In my binoculars I saw them attacking not just the mirrors and windows, but the windshield wipers, wheel covers, spoiler and tires. As I jogged closer, yelling they turned to vocalize at me (again, using several different calls). One even hopped on the roof and then slid down the back window, nails making screeching sounds all the way, several times. They defecated on the windshield and hood. I chased them off and one went off to the west and one circled by me and landed in the parking area a short distance away. To make my point, I ran after it. It flew off, slowly, just keeping ahead of me, calling out as I cursed at it. It finally flew off. I stayed by the car for a few minutes as they met up on some posts up the northern trail and called out to each other. I eventually headed slowly down the southern trail instead, looking back a few times, but I think they left the car alone at that point. Wanted for property damage misdemeanor. Two cows somehow managed to get on the wrong side of the fence and were pacing back and forth trying to figure out how to get back. They’d turn to face me, which gave me a slightly anxious feeling. I don’t generally have a fear of cows, but these are large animals whose intelligence might just take a back seat under high stress. 1,000 pounds of docile probably still hurts. 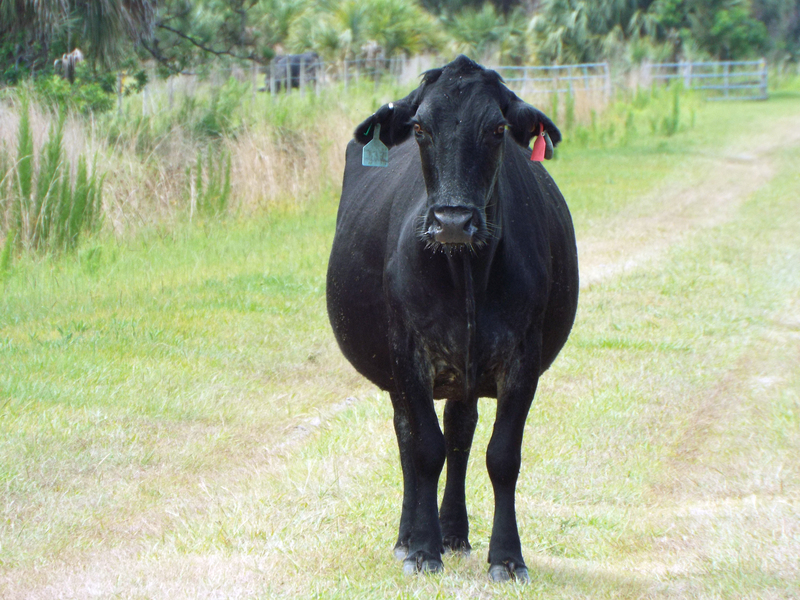 In the end, they generally stayed out of the way, even stubbornly so (there was another cow and a calf pacing along with them on the “right” side of the fence, but any time I tried to open a gate to reunite them, the two cows on the “wrong” side of the fence would freak out and run). I had to give up on any altruistic notions, and returned my attention to the birds. There were a few Cattle and Great Egrets among the grazing and lazing cattle, plus a few vultures. 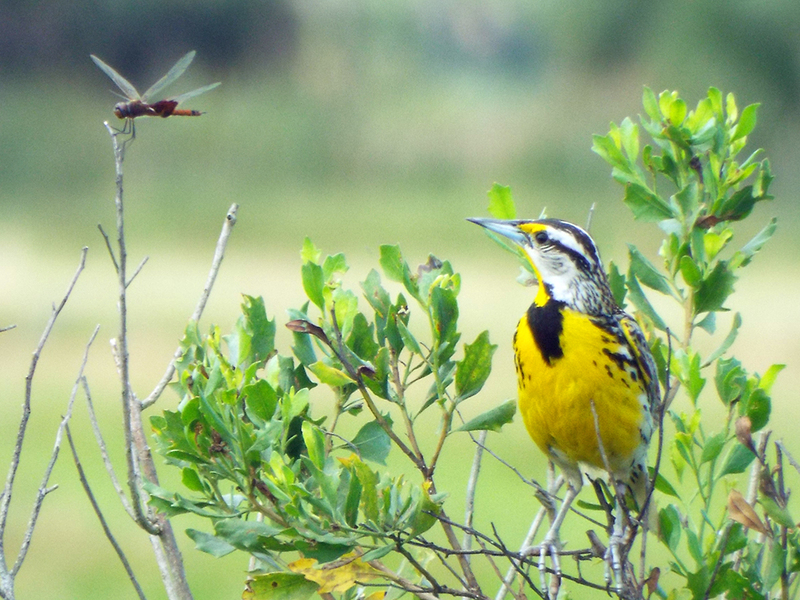 The Eastern Meadowlarks were the most visible and vocal of the birds I saw. 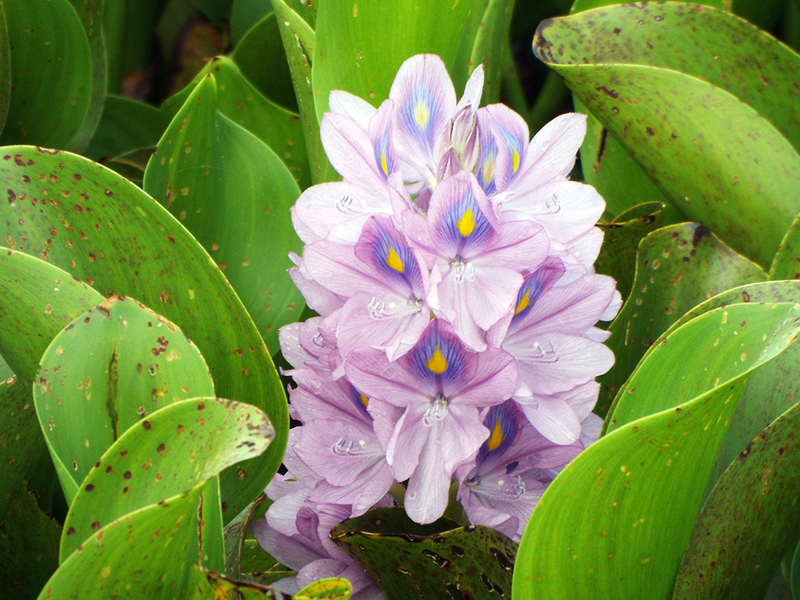 Many were busy rooting beetles and grubs out of the ground or snagging grasshoppers. I think they’d eat just about anything small, flying, and crawling. A musical and colorful puffball. The Bald Eagles’ nest was empty and I saw no evidence of Eagles anywhere. As I left the upper fields (those closest to the entrance) the birds became less numerous and the fields on either side of me were very silent. I decided to head back to the car and call it a day. Summer is generally considered a “slow” time for birding in Florida, but there’s always something going on if you know where to look. Like my brief detour in Orange County, there are birds breeding and raising young here. There are still heron chicks on the nest at the Wetlands, and the rookeries are noisy and busy. It just takes a bit more patience.